I was scrolling my twitter feed when I came across a game called Hair Nah, created by Momo Pixel. I was drawn to the game by a screenshot, a created character, and a game board with enticing colors. The game is fun and quick, but also informative. The character of “Hair Nah” is a young Black woman who loves to travel, but is reluctant because she constantly deals with people wanting to touch her hair. The object of the game is to get her to her flight while smacking away the reaching hands invading her personal space. “Hair Nah” starts by allowing the user to customize a character. First you choose the skin complexion, and then a hairstyle from various choices. I was excited about the different hairstyles available to choose from. 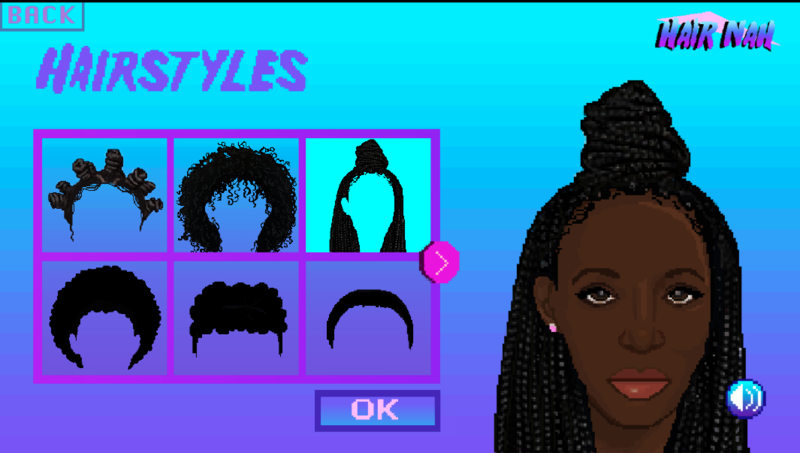 Many times when it comes to creating players in games, there is a lack of variety in Black women hairstyle choices. “Hair Nah” had styles ranging from Bantu Knots to straight long wraps. After customizing a character, the user is ready to begin the game. The game features three different levels, increasing in difficulty with each level. The goal is to keep the prying hands away from the characters hair. Each time a hand is smacked away it triggers a smacking noise that reminds me of a high energy fighting game. It is fun to smack the hands away as the point meter increases. Once the user completes the 3 rounds of the game, getting the character to her flight successfully, an informative message is given. “Hair Nah” brings awareness to what it calls a common issue for Black women. On a daily basis Black women deal with people invading their personal space and creating a nuisance to their daily activities by touching their hair. This could happen while traveling to another country, or by simply being outside for the day. “Hair Nah” is a fun game, while also being informative about an issue that doesn’t normally get much attention. The game can be found at www.hairnah.com.